We recognize the value of project and program management is much more than assigning tasks and updating schedules. Our consultants bring with them the extra "industry insight and experience" you will not find with your typical project manager. 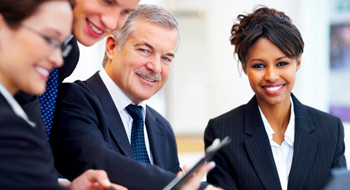 Beyond the execution of a project life cycle, our Strategic Project Managers provide the thought leadership, business acumen, and change adoption skills to ensure that disparate groups of stakeholders are engaged efficiently and focused on your desired business results and benefits are realized for the long term. With extensive business consulting backgrounds and experience interacting with all levels of stakeholders in an organization, our consultants are people you can trust – people you can put in front of the business, IT, or executive management with confidence. Our consultants are seasoned professionals that know how to lead. We bring structure, discipline, and experience with the flexibility to adapt to your organization and drive your technology projects to the finish line. Many organizations need to evaluate, prioritize, and staff a large number of projects with a limited pool of resources and budget. FOREFRONT has considerable experience managing project management offices with a rigorous discipline that is required to ensure your business goals can be attained leveraging your existing assets and resources. Projects often fail due to a lack of direction. Our governance framework provides a solid foundation to ensure projects follow the standards defined around specific deliverables and recommends a structure to support issue resolution in order to deliver successful results. Operations, Program and Technology projects consume a tremendous amount of capital. Our consultants understand "the devil is in the details". Project budgets need to be developed and monitored on a granular level, so projects are delivered on time and on budget. Sometimes the best decision is to walk away. Evaluating each project is critical to ensure limited resources are allocated to the most important projects. Our consultants have considerable experience developing solid business cases. We are often called upon as a trusted advisor to manage system integrators and technology vendors through project implementation. We serve as an unbiased conduit between all parties and keep projects on track. A successful project is ultimately measured by widespread user adoption. This is much easier said than done. Our consultants engage users throughout the project lifecycle to generate excitement and momentum to ensure change is sustained. Whether you’re navigating your way through Sarbanes-Oxley, HIPAA, E-Verify, PREA or a myriad of other regulatory environments, rest assured, FOREFRONT consultants have been there and done that. Our Strategic Project Managers have managed numerous initiatives, utilizing a variety of methodologies across public, private and non-governmental industries. Full assessment, development life cycle, structured development, process improvement, and project management methodologies are second nature to our consultants, allowing them to quickly assimilate into your methods and practices. In addition, each consultant has real-time access to the expertise of all FOREFRONT consultants through our knowledge sharing and collaborative tools, which means they bring practical best practices and timely answers to address your critical issues. Want to learn more about Forefront?